(Link / Speed / Activity for each port), 12 to 36 VDC and 10 to 24 VAC power inputs with removable terminal blocks. 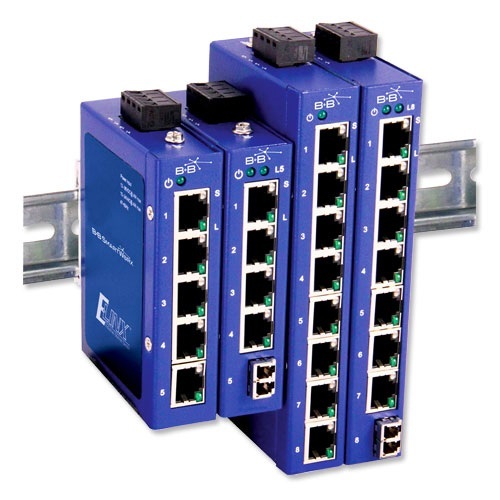 These switches are perfect for any applications that require special protection from hash environments. Choose a switch with five or eight copper ports, or a combination of copper and fiber ports. Multi-mode fiber models extend range up to 2 km. Single-mode fiber models extend range up to 20 km. All models require an external power supply (sold separately). The switch ships with 4 panel mount clips giving the user 6 different ways to panel mount the unit.